59421 Private John Joseph Jackson, 22nd Battalion, the Durham Light Infantry was killed in action 26 March 1918 and is commemorated on the Pozieres Memorial. He was 26 years old and is commemorated on the West Auckland War Memorial. In 1901, the family lived at 50 Dunston Street, Hebburn where Ernest worked as a coal miner (hewer). By 1911, they lived at 8 Johnson Street, West Auckland and 46 year old Ernest still worked as a coal miner (hewer). 19 year old John Joseph and 16 year old Reuben both worked as coal miners. 27 January 1911, aged 18 years 10 months John Joseph Jackson enlisted into the 6th Battalion, the Durham Light Infantry his local Territorial Force. He was given the regimental number 1333. John Joseph worked as a coal miner for Bolckow Vaughan (West Auckland Colliery). He undertook at medical examination 20 February 1911 and considered fit for the Territorial Force. He was 5’7½” tall. He was embodied 5 August 1914 and 26 January 1916 his engagement in the Territorial Force was terminated. At some time later he joined or was transferred to the 22nd Battalion, the Durham Light Infantry and was given the regimental number 59421. 3 March 1918: Soviet Russia made peace with Germany and her allies by virtue of the Treaty of Brest-Litovsk. As a result, Germany could now transfer troops from the Eastern Front to the Western Front. More importantly, these Divisions included the original elite of the German Army – the Guards, Jaegers, Prussians, Swabians and the best of the Bavarians. In all, 192 Divisions could be deployed in the West. The Allies could field 178 Divisions. A single division numbered about 19,000 men  so Ludendorff could call upon about 3,650,000 men as opposed to the Allies 3,380,000. Thus, the Germans now held superiority in numbers. Between 21 March and 10 April, the 3 main assaulting armies had lost 303,450 men – 1/5th of their original strength. Added to this the poor diet of the German troops, battle fatigue, discontentment with the military leadership, social unrest at home and a general realisation that their great effort was beginning to wane, the Allies counter attack in mid-July began to seize the initiative. Sweeping victories over demoralised German forces eventually led to the resignation of Ludendorff 27 October, the abdication of Kaiser Wilhelm II, 9 November and the signing of the Armistice 11 November 1918. Often called “the Kaiserschlacht” the offensive was Germany’s last big effort to win the war before the arrival of huge numbers of American troops. The German plan, Operation Michael was to punch through the British and French Armies at St. Quentin, cut through the Somme and then wheel north-west to cut the British lines of communication behind the Artois fronts to bottle up the BEF in the narrow neck of Flanders. The British Army would be surrounded with no means of escape and would inevitable surrender. The target of the first phase of the offensive was the British Army who the German High Command believed to be exhausted by the four major efforts of 1917, namely Arras, Messines, Passchendaele and Cambrai. By mid-February 1918, there were 177 German Divisions in France and Flanders out of their world-wide total of 241. Of these, 110 were in the front line of which 50 faced the short British front. A further 67 were in reserve with 31 facing the BEF. The British had 62 under strength divisions defending a recently extended front line. However, “only” 2/3rds of the German casualties were wounded so a substantial number would return to the fighting at a later date. By contrast, 28,000 of the British would not return – 7,000 were dead and 21,000 had been taken prisoner. 23 March: 22/DLI was in billets at Rosieres in reserve then was ordered to take over the line from the harassed 50th (Northumbrian) Division. They marched through the villages of Chaulnes, Fresnes, Marchelpot, Omiecourt and Pertain. A Company initially formed the line west of Morchain then retired 500 yards to a position near Potte Wood. B Company was also in this area. C Company was in reserve. 25 March: in the morning the Germans launched a mass attack with artillery and infantry. 22/DLI retired to Omiecourt then, fighting all the way, the battalion was ordered to retreat to Chaulnes which was reached by evening. 26 March: at dawn, the battalion withdrew to Lihons then by the evening it was beyond Rosieres in the Divisional Reserve. 27 March: by noon, the enemy pressed towards Proyart and the position was critical. 22/DLI moved towards Harbonnieres looking to counter attack with the 2/Devons and the Germans were driven back towards Proyart. But the position could not be held for long. 28 March: in the morning, the whole line of the 8th Division was in danger from the north and south. There were an estimated 400 casualties in the 3 days since leaving Ypres. The Division was pursued back to Caix, Cottenchy and Moreuil Wood. 2 April: the battalion was relieved by French troops. Private J.J. Jackson was awarded the British War and Victory medals. 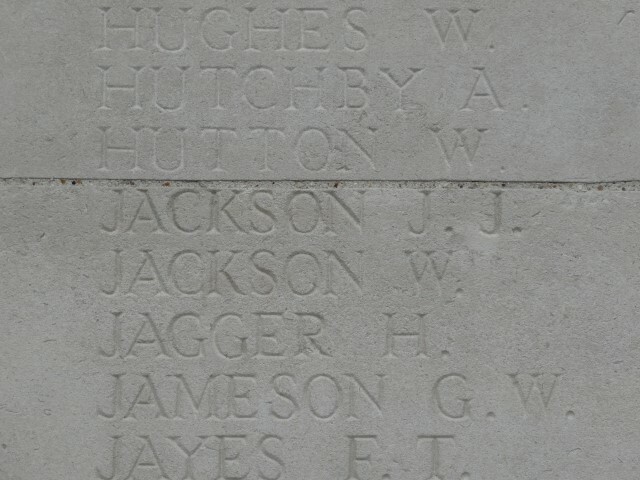 Private J.J. Jackson is commemorated on the Pozieres Memorial, France. Pozieres is located some 6km north east of Albert, Somme, France. 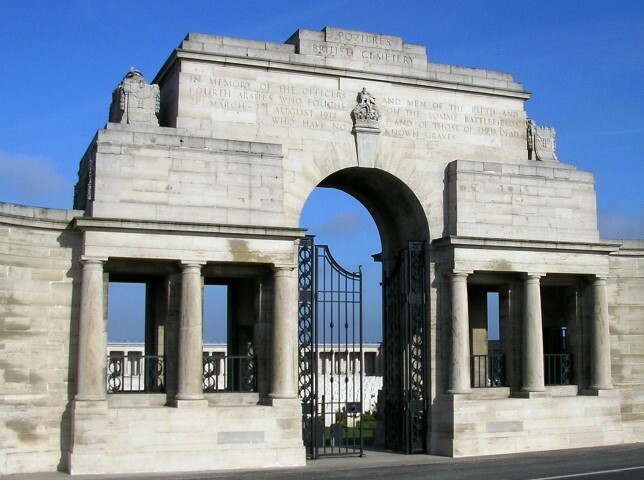 The Pozieres Memorial relates to a period of crisis in March and April 1918 when the Allied Fifth Army was driven back by overwhelming numbers across the former Somme battlefields and the months before the Advance to Victory which began 8 August 1918. The memorial commemorates over 14,000 casualties of the UK and 300 South African Forces who have no known graves and who died on the Somme between 21 March and 7 August 1918.